BH3 plans to develop AltaWest, a mixed-use property containing 165 residential units and office and retail space, all on about six acres within a federal Opportunity Zone. The town that was once derided as “Dull Ray” has been anything but that as of late, particularly when it comes to commercial development. Sandwiched between Boca Raton and West Palm Beach, Delray Beach earned that boorish nickname due to how few nightlife options it had on offer. But today, the East Atlantic Avenue corridor of downtown Delray Beach is a hot spot for shops, restaurants and bars that some real estate pros compare to Lincoln Road in South Beach. And denser development is on the way, both downtown and in areas that fall within the city’s federal Opportunity Zones. Thanks to the program, which launched with the signing of the 2017 tax law, investors who develop real estate in such zones, designated as distressed areas, can defer capital gains taxes. Delray Beach’s zones lie west along Atlantic Avenue toward I-95 — a sparsely developed corridor within a two-square-mile area. Combining retail and offices with residential units and a hotel, the Midtown Delray Beach development on West Atlantic Avenue falls within an Opportunity Zone. The local developer of the project, Hudson Holdings, has attracted private equity firms that raised Opportunity Zone investment funds and want to park capital. “A number of them have contacted us. I can’t name names. But I can tell you, there is a lot of interest,” said Hudson Holdings principal Steven Michael. He expects the Opportunity Zone designation to spur increased development throughout Delray Beach’s West Atlantic Avenue corridor. “That would have happened with or without the Opportunity Zone, but I think it will accelerate that investment,” Michael said. 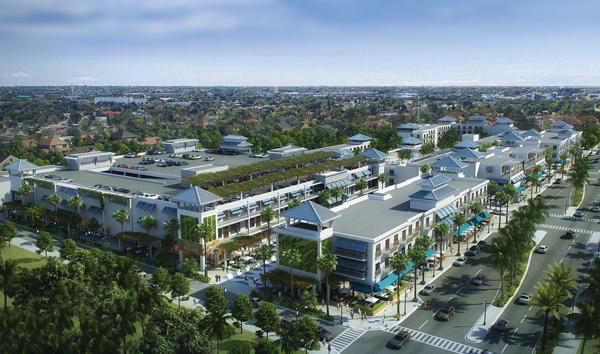 In January, Delray Beach’s Community Redevelopment Agency chose Aventura-based BH3’s mixed-use project AltaWest as the winning proposal among six submitted by firms bidding to develop the land at the 600, 700, 800 and 900 blocks on the south side of West Atlantic Avenue. The project will contain a grocery store, 165 residential units, 21,600 square feet of office space and 43,000 square feet of ground-floor retail space, all on about six acres of city-owned land within the Opportunity Zone. “There’s a lot of infrastructure that hasn’t been touched in decades that needs to be upgraded, and those are things we believe the municipality is well-suited to do,” said BH3 principal Daniel Lebensohn. He added that he has discussed financing for AltaWest with potential investors, including a real estate-oriented private equity fund with $100 million to invest in Opportunity Zones. Six blocks east of AltaWest is Hudson Holdings’ mixed-use Midtown Delray Beach development, a seven-acre site at West Atlantic Avenue and Swinton Avenue. Midtown hopes to deliver 47,000 square feet of restaurant and retail, 93,000 square feet of office space and 100,000 square feet of housing and hotel space. Over in no-longer-dull downtown Delray Beach, big development projects are underway, though they may not appear so large at first. 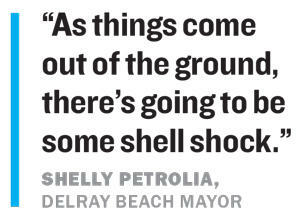 The four-story limit on building height west of the Intracoastal Waterway is the essence of “that charm that people get and sense when they drive into Delray,” Mayor Petrolia told TRD. Few developments will redefine downtown Delray Beach more than Atlantic Crossing, with 82 condos, 261 rental apartments, 76,000 square feet of retail and restaurant space and 83,000 square feet of office space. Merrill Lynch is an anchor office tenant. The nearby 4th & 5th Delray complex, which will contain an eight-screen iPic movie theater, will also be home to the new headquarters of iPic Entertainment, parent company of the iPic theater chain, which will relocate its home office from its base in Boca Raton. Hamid Hashemi, the founder, president and CEO of iPic, said his company is investing in a bustling nightlife scene along Atlantic Avenue that draws out-of-towners as well as locals. “People come from all over the place,” Hashemi said. “People in Fort Lauderdale will drive up to Delray, because there is a much greater concentration of bars and restaurants and entertainment.” And more is coming. In January, a joint venture led by 13th Floor Investments, Key International and CDS International bought the former Office Depot headquarters in Delray Beach for $33 million. The group intends to redevelop the property into one of the biggest projects in the city’s history. The 43-acre site at 2100, 2300 and 2350 South Congress Avenue and 2200 Old Germantown Road will be home to 600 apartments, 150 townhomes and 100,000 square feet of retail and restaurant space. The unnamed project is expected to break ground later this year, said 13th Floor Investments managing principal Arnaud Karsenti. Delray Beach’s popularity is one reason behind a local surge in hotel development. Menin is planning The Ray, a 141-room hotel that would replace a former Piggly Wiggly just north of East Atlantic Avenue. On sites just south of East Atlantic Avenue, Kolter Hospitality is building a 150-room Courtyard by Marriott, and Jericho, New York-based Samar Hospitality is building a 122-room Aloft and an adjacent 35-unit condominium.